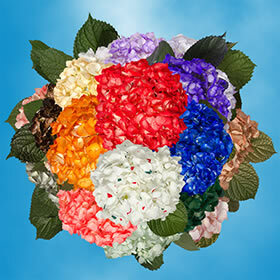 Globalrose offers the best hydrangeas year-round for any special occasion. Used as centerpieces, bouquets, decorative decor and more, our selections are beautiful in their natural state or tinted in any shade you desire. In any setting, formal or fun, you can be assured of them at your event. We provide the freshest florets, grown in state-of-the-art greenhouses to give you blossoms that display a natural bloom. The petals on our products are crisp and dewy, as if they were picked the same day. We have the best products and offer them at wholesale prices. It doesn't matter - tinted or natural, our prices are consistent. You can take comfort in knowing that from our greenhouse to your door, your orders will arrive event ready. Freshly cut and shipped via FedEx, your orders will have longevity from arrival to completion. 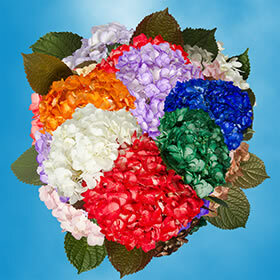 Select the best hydrangeas on the market today for your event. Quality, freshness and on-time delivery are crucial to its success. You want versatile, unique florets that display the perfect mood, and we can help you with that. 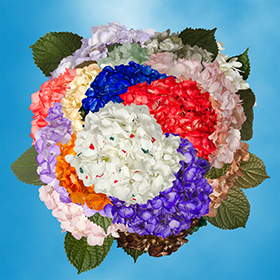 Globalrose carries the best hydrangeas at great wholesale prices and guaranteed availability. We don't just sell flowers, we manufacture repeat customers. You'll be happy with your choice!